A songwriter for as long as she can recall, Los Angeles native Jessica Fleischer has been toying with bedroom demos for years and occasionally playing small venues around her hometown. Fortunately for her, Robert Schwartzman, the mouthpiece for Rooney and Fleischer's longstanding friend, made himself a personal studio and thus Lots Of Love had a place to be realized. Fleischer's personal songs sound right at home with the current wave of female indie artists, yet she also draws parallels to girl groups from the '60s. Not so surprisingly, the songs of Lots Of Love surround the idea of love, though mostly from an angle of wanting, losing and not seeing reciprocated love. It's hard to believe a voice as sweet as this would suffer from these woes, but there's little doubt that Fleischer is telling autobiographical stories. This is an album where the cover art gives you a great indication of what's to come. 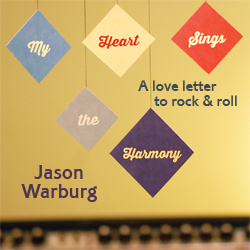 It's easy going on the ears, universally relatable and has a retro feeling amid charming pop song craft. "Sitting In A Box" leads off with Fleischer's distinct, alluring voice reeling you in with music that is reminiscent of the best moments of Rilo Kiley. It's breezy, a little rustic and lovely pop rock. Title track “Lots Of Love” dips into the doo-wop influences and wouldn't be far off as a lost B-side from The Ronettes, while "From The Start" and "It's So Hard" are upbeat and jangly and parallel today's most esteemed indie rockers. Much of this moves swiftly, such as the rollicking piano heavy "It's Happening," though others like "I Think It's Called" are acoustic guitar driven and slower. Lots Of Love is the real deal. Fleischer is someone who writes songs from the soul and puts time into her trade. With some push into mainstream outlets, this young woman could be on the cover of glossy magazines at the grocery store checkout. When the world tires of Miley and Christina, Fleischer has my vote for the next female icon. If you listen to From The Start, you're likely to feel the same. © 2013 Tom Haugen and The Daily Vault. All rights reserved. Review or any portion may not be reproduced without written permission. Cover art is the intellectual property of I Like My Hat Records, and is used for informational purposes only.